In the prime of his career, Ukrainian striker Andriy Shevchenko was an AC Milan hero. Both domestically in Italy and in UEFA Champions League play Schevchenko broke records and lit the pitch up with his prolific scoring ability. Many fans know about his distinguished career and success with Dynamo Kiev, AC Milan and the Ukrainian National Team, but we take a look at the less known things about "Sheva". Andriy Shevchenko was born in a tiny village in Ukraine called Dvirkivschyna. The little village has just five small streets and is located less than 250 kilometers from Chernobyl. One of Shevchenko's close friends is 80 year old fashion designer Giorgio Armani. The two are also in business together having opened a couple of boutiques in the Ukraine. After retiring from football in 2012, Shevchenko joined Ukrainian political party Ukraine - Forward! (Україна – Вперед!). Andriy entered the parliamentary elections, but came in second place within his party. 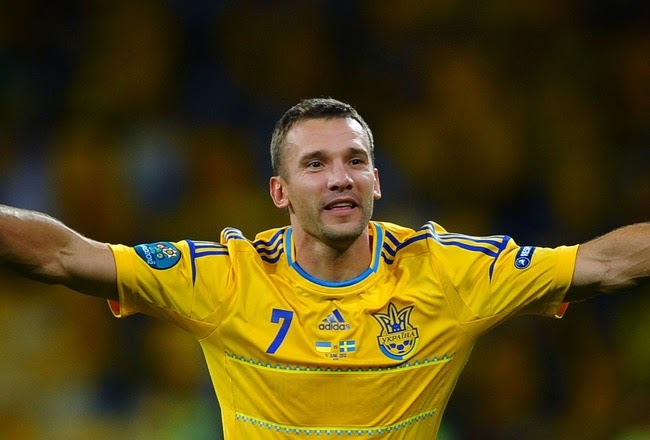 Andriy Shevchenko is the all-time goal scoring leader for the Ukrainian national team. While his record of 48 goals for his country is known to many, what's interesting is the fact that the two footballers sitting in second place behind him only managed a combined tally of 30 goals for their country, with 15 each. Media tycoon and former three-time Italian Prime Minister Silivio Berlusconi is the godfather of Shevchenko's first son Jordan. Sheva was playing for Berlusconi's AC Milan in 2004 when his son was born.